Thoughts, opinions, ideas about the art of teaching private music lessons. This blog will cover all aspects of the teaching profession: growing a studio, pedagogy, technology, methods and more. Whether you are a current music student or thinking about starting lessons, this blog is for you! Topics will include the benefits of music lessons, tools and practices to allow you to succeed and more. Check out our reviews for music teachers and students. We will review goods and services that pertain to the teaching and study of music here. We will also link to these products so that you can purchase them if you like. We will connect you to other resources that will enhance your teaching and study of music through our helpful links for music teachers and students. 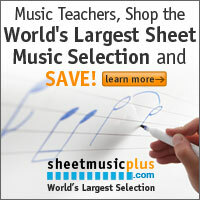 Business supplies, music, programs, resources to find music teachers and more.